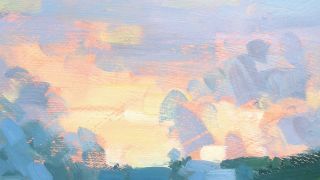 Skies needn't be such a challenge to paint if you follow these simple tips. Skies are one of the most beautiful things you can witness in nature, and are often a great source of inspiration for artists – but how do you paint them with oils? The brushes used here combine the silkiness of traditional synthetic brushes with the firmer feel of hog bristles. The rounded edges offer a softer application. The primed boards have a good absorbency. A common mistake when painting landscapes and cityscapes is to treat the sky as the last step of the painting, as an afterthought, which makes it look like it doesn't belong with the rest of the scene. It should be painted in connection with the rest of the painting in order to achieve a convincing and homogeneous result in terms of colours, brushwork, tones and composition. So think at the beginning about how you want to depict the sky, how much importance and space you want to give it, and the mood that you are aiming to convey with it. In terms of painting techniques, another tendency artists have with skies is to over-blend. It is tempting to keep pushing the paint around, but then all the colours end up in a big grey puddle. Instead, try having distinct areas and visible brushstrokes with a combination of soft edges and hard edges to keep things interesting. Keeping this in mind, here are five simple tips for painting skies that I've learned over the years, which will hopefully help you achieve beautiful convincing skies with oil paints. But remember, the main tip should always be to have fun! It is easy to get caught out painting a sky with your brain instead of your eyes. The brain tells you the sky is blue. The eyes, if you make them work hard, will see hues of blue, yellow, pink and green. Really look for the colours and enjoy expressing them freely. You might want to avoid using pure colours, though, as the sky is rarely pure blue and the clouds are rarely pure white. Instead, use various mixes that contain pigments present in the rest of the painting. This will harmonise the whole scene. Embrace the dull grey areas in the sky as they enhance the bright highlights. Indeed, your most vibrant light will often look the most intense next to a grey cloud. Skies are often the most abstract part of a landscape, so you can really have fun conveying energy and drama with big brushstrokes applied with freedom. This is the part of the painting where you can truly showcase your brushwork and your personality as a painter. Reconnect with the two-year-old child inside of you who used to have fun with brushes! Use your largest brushes and be as loose as you can, but try to make every brushstroke count. You don't need to show things exactly as they are, you can adjust elements to improve the composition and create more or less drama. What matters is that you convey the right mood in a convincing way. I usually build up a painting with layers from dark to light, ending up with the thickest application of paint for the highlights. However, sometimes I decide to use the ground colour of the background for some of the highlights, as in this painting's detail. This is a technique I often use to achieve vibrant sunsets. To do this, prime your canvas with a bright orange or yellow and then add the clouds, greys and blues in the skies, making sure you let some of the ground colour show through, especially in the most vibrant parts of the sunset. Finish with some touches of bright yellow mixed with white to really enhance the focal points. Having clouds that look like sheep or candy floss is a fear that most painters share. Clouds make lovely shapes in the sky, but when reproduced on canvas, they often look out of place. My advice is to view them as solid objects with three dimensions, which are affected by the sun. The sides of the clouds the furthest away from the sun should be the darkest, and the ones the closest should be the lightest. But remember to vary the application of soft edges and hard edges. Thicker or whiter clouds can benefit from strong brushstrokes with hard edges, while thinner or paler ones could be suggested with more subtle marks. One of the reasons I love painting trees so much is the way the foliage and the sky overlap and mix in a beautiful way. The area where these two meet can be tricky to paint, however, as there is a risk of smudging the various colours together. To avoid this, I recommend working with layers. I usually paint the dark mass of the tree in a thin layer that dries quickly, before applying the colour of the sky around it and filtering through the leaves. Here's a little tip: the colour of the sky through the branches is a little darker than the actual sky. When the sky is fairly dry, I apply some small patches of leaves that detach from the tree to depict the loose branches.